Fifty years ago, Rachel Carson’s Silent Spring warned of the danger of widespread use of pesticides, helping to launch the environmental movement in the US. Around the same time, the US military began to spray defoliants in Vietnam to deny cover to guerrilla forces. The defoliants, including Agent Orange, were contaminated with the deadly toxin, dioxin. Agent Orange continues to affect the children and grandchildren of those exposed in Vietnam and America to this day. Heather Bowser, the daughter of an American veteran, was born missing a leg and some fingers. Her father’s exposure to Agent Orange is thought to be the cause of her birth defects. Heather visits Vietnam and discovers the importance of building links between victims of Agent Orange in the US and Vietnam. 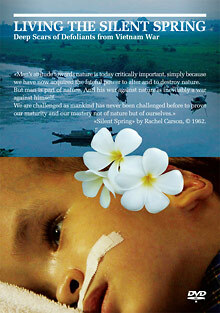 Living the Silent Spring depicts the struggles and courage of American and Vietnamese children who bear the imprint of Agent Orange, and asks us to once again pay attention to the prophetic warnings of Rachel Carson.